Acrylic paint, mica, gold, silver, copper, palladium on plexiglass 44 ¾ x 30 ¾ in. JANE HAMMOND incorporates an encyclopedic collection of images — from the past and present, history and fiction — to explore the fluidity of meaning as images shift, a process she has referred to as &ldqo;recombinant DNA.” Hammond’s works can be found in numerous museum collections including the Museum of Modern Art, New York; Metropolitan Museum of Art, New York; National Gallery of Art, Washington, D.C.; Walker Art Center, Minnesota; Whitney Museum of American Art, New York; Museum of Contemporary Art Chicago, Illinois; and Albertina, Austria. 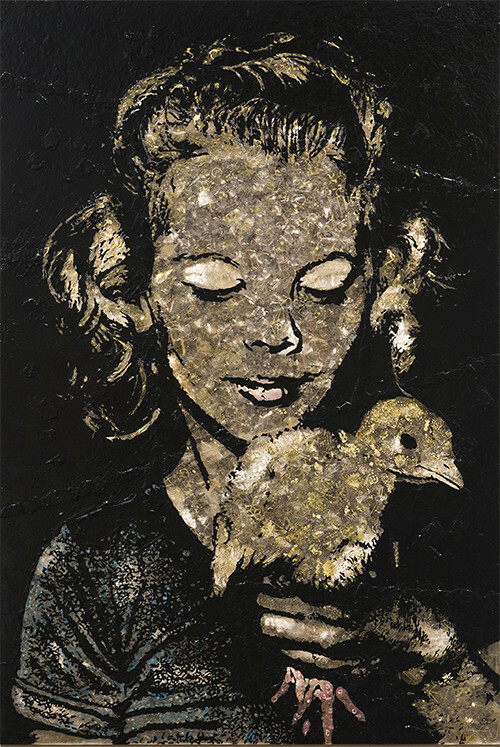 Her works have been the subject of solo museum exhibitions at institutions including the Museum of Contemporary Art San Diego, California; Mount Holyoke College Art Museum, Massachusetts; deYoung Museum, California; Museum of Contemporary Art Denver, Colorado; Detroit Institute of Arts, Michigan; and FLAG Art Foundation, New York. Hammond was born in Bridgeport, Connecticut, in 1950. She currently lives and works in New York City.